Hop in a Supercar of your choosing, a Ferrari or perhaps a McLaren, and take a cruise through the streets of Edinburgh, stopping at local artisan suppliers to pick your fresh ingredients and bring back to the hotel where Head Chef, David Scott, will whip up a fabulous meal complete with wine matchings. If this doesn’t turn heads then we don’t know what will. For the price of £3,800, you will get 24 hours' Supercar rental, 2 nights in a Jacuzzi Suite, half a bottle of fizz, a limo transfer to and from the airport, two dozen red roses, dinner with champagne, canapés and wine, a saucy ‘gift box’ in your room and a shopping experience to pick your very own champagne worth £500. Walk your way around St James, London, following a culinary trail at 4 of London’s Taj restaurants. Start off outside, underneath the stars at the St James’ Courtyard with canapés and fizz, before moving onto the Bistro for your starter. Work up an appetite as you walk on to Quilon, a Michelin-starred South-West Indian style restaurant. Finally, you can thaw out at Taj 51 Buckingham Gate Suites and Residences and finish off with a dessert platter. Dog lovers can head to Farncombe country estate in The Cotswolds, said to be one of the best in the UK and with 400 acres to frolic in, you could certainly lose yourself (and hopefully not each other, nor the dog). There are three hotels set within but our choice for total luxury would be Foxhill Manor. It’s a small private house hotel with just 8 suites and has a ‘wherever, whenever’ policy. Fancy a three course meal with scallops for a starter, rack of lamb for main course and something with strawberries for pudding? No problem. The chef will cater to your every culinary whim. Sister hotel, Dormy House, has an award winning spa, so be sure to book in. Good for those who don’t want to think about a thing and who love a good walk. Rates at Foxhill Manor start from £295 per room per night. Price based on two people sharing and includes full English breakfast, snacks and drinks throughout the day, full access to House Spa and VAT. After a hard day shopping, book into the luxury Asmara suite containing a private sunken stone bath complete with the all important jets, steam room and side by side treatment tables. For £620 the room is yours to indulge in 2 hours worth of treatments and an extra hour to use the facilities. The Asmara Suite package includes 2 hours of treatments time and an additional hour of relaxation time to use the en suite facilities. This 180 minute package is £620. 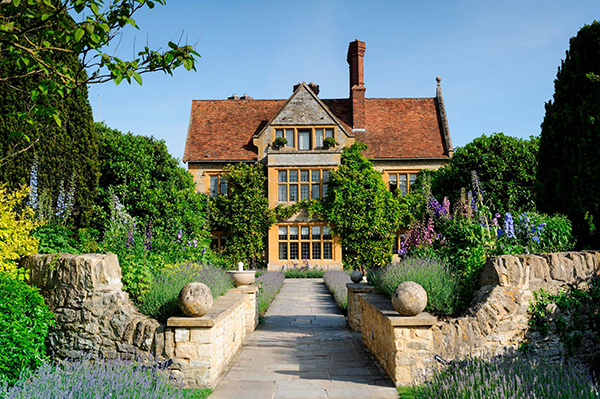 You'll be in safe hands at the well-known Le Manoir aux Quat’Saisons, synonymous with the lovely Raymond Blanc and his two Michelin star restaurant. If all you’re looking for is classic luxury with quality food, then look no further. The grounds to this fine hotel are stunning and tandem bikes are available for hire if you want to explore further. Bicester Village outlet is nearby, so it’s perfect for a shopping trip. If you’ve not already stuffed yourself with the delicious patisseries, enjoy dinner for two from a choice of menus and luxury overnight accommodation in one of the bedrooms or suites. Take home a seasonal candle created by Branche d’Olive. The Romantic Escape costs from £850 per night, based on two guests sharing, and is valid for stays during February 2016. This hotel is situated just a few miles from Heathrow airport and is a favourite at Wylde HQ. See our comprehensive review here. The hotel are fully embracing Valentine's with guests able to book an overnight stay, a bottle of Veuve Clicquot champagne, hotel-made chocolate treats and a full English breakfast. Check out the brilliant spa as a face or body treatment comes with the deal. A Valentine’s Afternoon Tea is on offer for £47.50 per person and a special Valentine’s Tasting Menu with canapés and champagne and classic British dishes is available too. The overnight Valentine’s Day offer is valid from February 12-14, 2016 inclusive and is subject to availability. Rates start from £400 for a Stable Superior per night, based on two people sharing. Whisk your loved one away for a weekend in Florence and stun them with a very special gift; let them design their own piece of jewellery. Head to the Fratelli Piccini boutique, one of the oldest jewellery makers and design your own necklace, brooch or whatever you fancy. Meanwhile, enjoy a four-course dinner overlooking the river in the hotels’ restaurant before finally getting to use the special Arno Suite. And of course, don’t forget the champagne breakfast in bed. Portrait Firenze’s Valentine’s Weekend package is available on Saturday 13th February 2016 and costs from €670 per room per night, excluding taxes. Fans of saucy underwear will love this extremely over-the-top treat. The hotel is offering a 2 night stay with a private Agent Provocateur fitting and a special gift (hopefully something lacy and silky! ), use of the spa with a specially created facial or massage and a bottle of Pink Fizz on arrival. The Temple House is situated in Chengdu, Sichuan Provence, famous for its fantastic food... and pandas. The Agent Provocateur Getaway Package starts from RMB 3,888 (approx. £414) for two nights.